Abies borisii-regis, as described in 1925 by Johannes Mattfeld (1895-1951), in Notizblatt des Botanischen Gartens und Museums zu Berlin-Dahlem, 9th edition, is commonly known as the King Boris fir, Bulgarian fir or Macedonian fir; as well as Българска ела (Bŭlgarska ela) in the Bulgarian language and makedón jegenyefenyő in Hungarian. The species name honors Tsar Boris III (1894 - 1943) of Bulgaria, during whose reign it was described as a new species in 1925. The name is sometimes cited without a hyphen (Abies borisiiregis), though under the provisions of ICBN the hyphen is to be retained. Description. 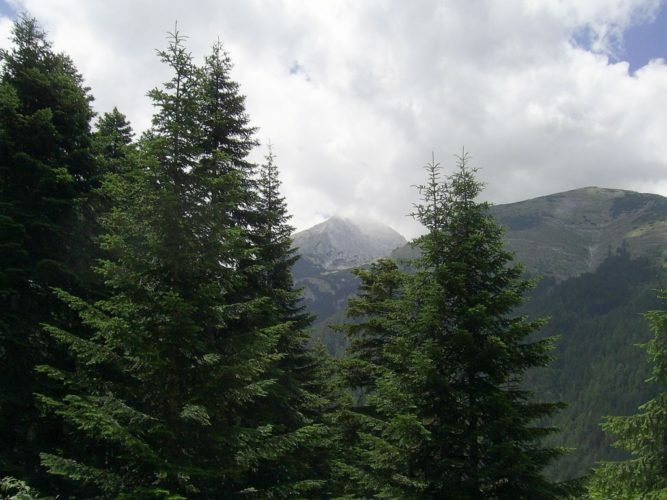 Bulgarian fir is a tall evergreen coniferous species of tree that grows to mature heights of 100 feet (30 m) tall with somewhat variable characteristics. It does not branch at the basal portion. Young branches are light-yellow in color and dense with soft yellow or black pubescence when young, but quickly becoming glabrous. Foliar buds are lightly resinous. Needles are densely arranged, not parted above, oriented upward and to the side. Individual needles measure up to 1.25 inches (30 mm) long, acute to nearly prickly, occasionally somewhat emarginate, furrowed above and usually without stomata, but with 2 white stomatal bands beneath, each with 6-10 lines. Seed cones are cylindrical to conical, measuring up to 6 inches (15 cm) long, seed scales short, tomentose, with exserted and reflexed bract scales. Distribution. This species is native to Bulgaria, northern Greece, Albania, and former Yugoslavia, where it grows at elevations of 2,000 to 5,000 feet (700 - 1700 m) above sea level in the Pirin Mountains of Southwestern Bulgaria and to 5,500 feet (1,800 m) of elevation in Greece. 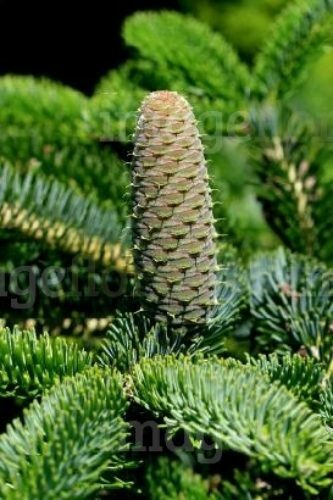 Abies borisii-regis — a closeup of foliage and seed cone.